First presentation starts at 1 p.m. Second presentation starts at 2:30 p.m.
“What’s New at Ukraine SIG” and “Choosing the Right Family Tree Software” will be the topics of two presentations by genealogist Chuck Weinstein at the Sunday, July 16, 2017, meeting of the Jewish Genealogical Society of Illinois. This special meeting will start at 1 p.m. at Temple Beth-El, 3610 Dundee Road, Northbrook, Ill.
For this meeting only, the JGSI library and help desk will not be available. For more information, see the Jewish Genealogical Society of Illinois website at jgsi.org or phone 312-666-0100. At 1 p.m.: “What’s New at Ukraine SIG” will describe the large amount of data that the Ukraine SIG is in the process of acquiring, including metrical records. Chuck will talk about what is available now, what the Ukraine SIG is getting, and its future plans. He will also talk about the Mormon Church of Latter-day Saints, Ukraine researchers, and how to choose a researcher in the Ukraine. At 2:30 p.m.: In the second presentation, “Choosing the Right Family Tree Software,” Chuck will discuss features and benefits of family tree software including Family Tree Maker, RootsMagic, MyHeritage, Legacy Family Tree, Reunion for Mac. He will help to sort out the options for both PCs and Macs. He will seek to clear up confusion over combining your computer family tree with online family trees. Chuck Weinstein began researching his family history in 1992. Two years later, he discovered a new internet resource called JewishGen and he has been involved ever since. 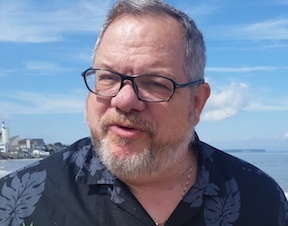 First as a moderator of the JewishGen Discussion Group, Chuck later became the project coordinator for what is now known as the KehilaLinks Project, running it from 1998 to 2004. He now serves as the towns director for Ukraine SIG and moderates its email discussion group. A past president of the Jewish Genealogy Society of Long Island, he was also the co-chair of last year’s IAJGS Conference in Seattle. He is currently writing a book on Holocaust research. Ukraine SIG is devoted to sharing histories, resources, data and research tips to help each other research Jewish genealogy in the region comprising nine historical Russian Empire gubernias, now mainly in Ukraine but also in Russia. Their website is at www.jewishgen.org/Ukraine.